What are the best options for an inflatable car mattress? Ever been on a long road trip, or had some other reason why you needed to crash in the backseat of your car for a night? How well did you actually sleep? What if there was a way that you could actually comfortably fit a twin sized mattress in there? 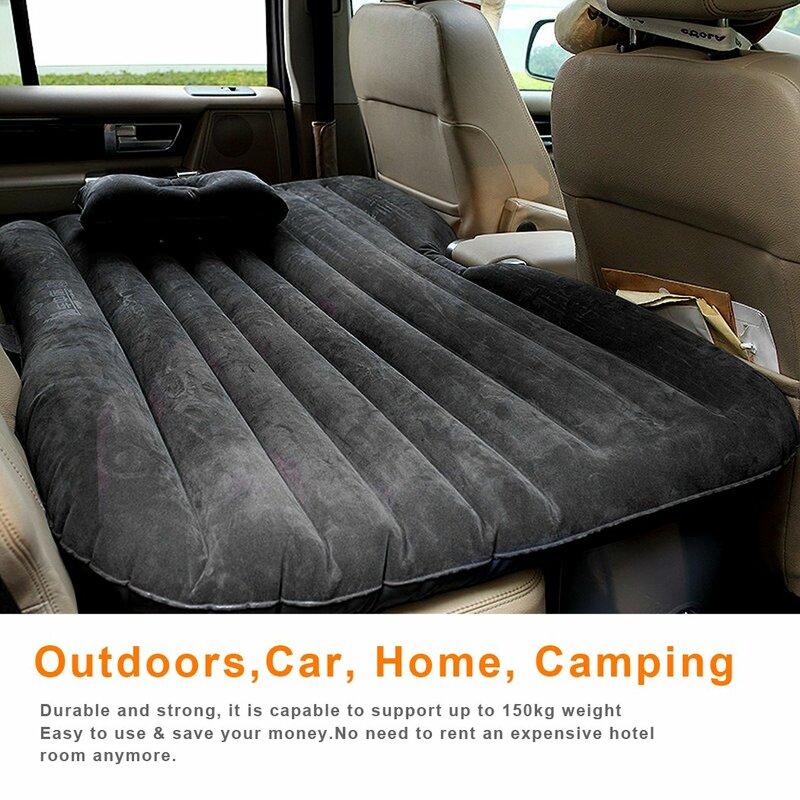 An inflatable car bed is a must have item for anyone who wants the freedom of a travelers lifestyle. Save hundreds, if not thousands a year with an inflatable car bed. Think about how much money you’ll save on hotel rooms. Would you rather overpay to sleep in some stinky, sleazy, possibly infested motel, or in the comfort of your own vehicle? 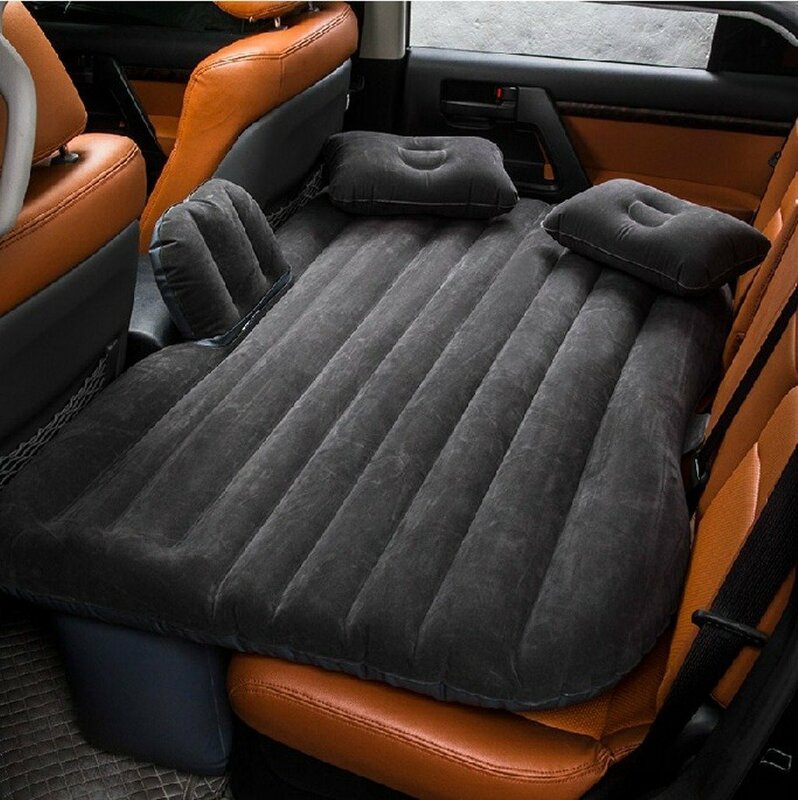 With an inflatable car mattress, your car actually becomes an easy choice as a place to rest your head. 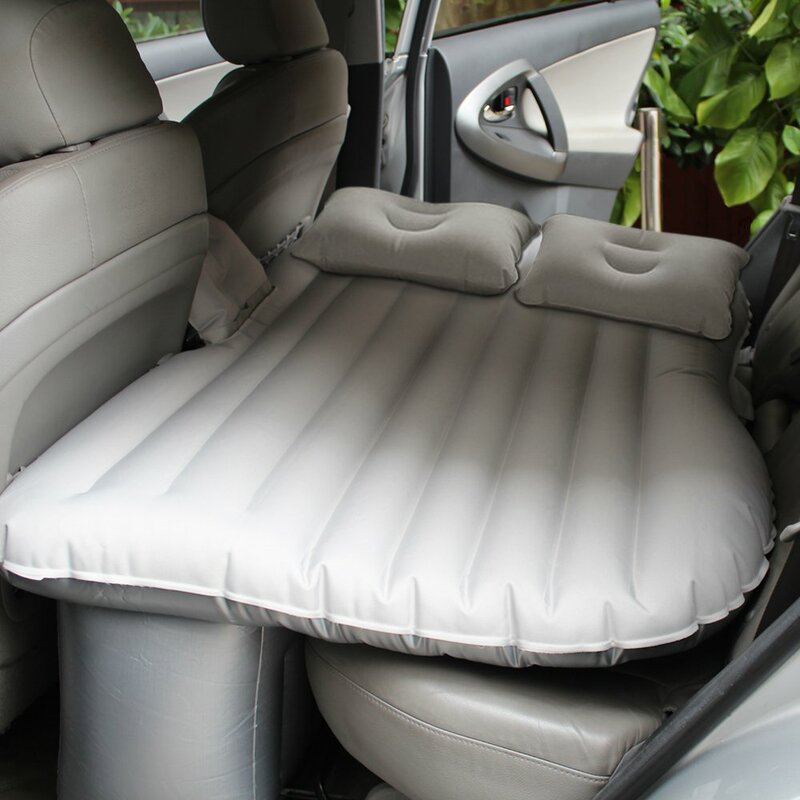 You’ll want to look for a back seat air mattress with high-quality grade PVC material, and make sure that it is properly rated for your weight. Generally the upper limit for the backseat inflatable mattresses we have listed is 300 pounds, so in most cases they will not work for 2 people. You might be ok pushing this recommended limit, but that risk is up to you. As long as you are not doing something unsafe like using the mattress while the vehicle is in motion, the worst that can happen is most likely ruining the mattress and having to buy a new one. Setting realistic expectations, you’ll have to ‘curl up’ a bit to fit. Unless you are 4 feet tall or a child, you will most likely need to curl your knees up to fit on the car air mattress. If you have slept in the backseat of your car before then this shouldn’t be any news to you. Don’t get me wrong, it will be way more comfortable once you have the air bed set up and inflated. The surface is even, across the entire width of the backseat, including the gap behind the front seats. You do not have to deal with the jabs and pokes of seat belts or the angled down-slope of the seat. If you have bucket style seating in the back, then you especially need this even-out effect. No more aches and pains, with proper orthopedic support. The comfort level of a backseat air mattress is enhanced by the cushioning power of air itself. The rear cabin of a passenger vehicle is not designed to properly support an individual’s lumbar, neck, and spine laying across it. 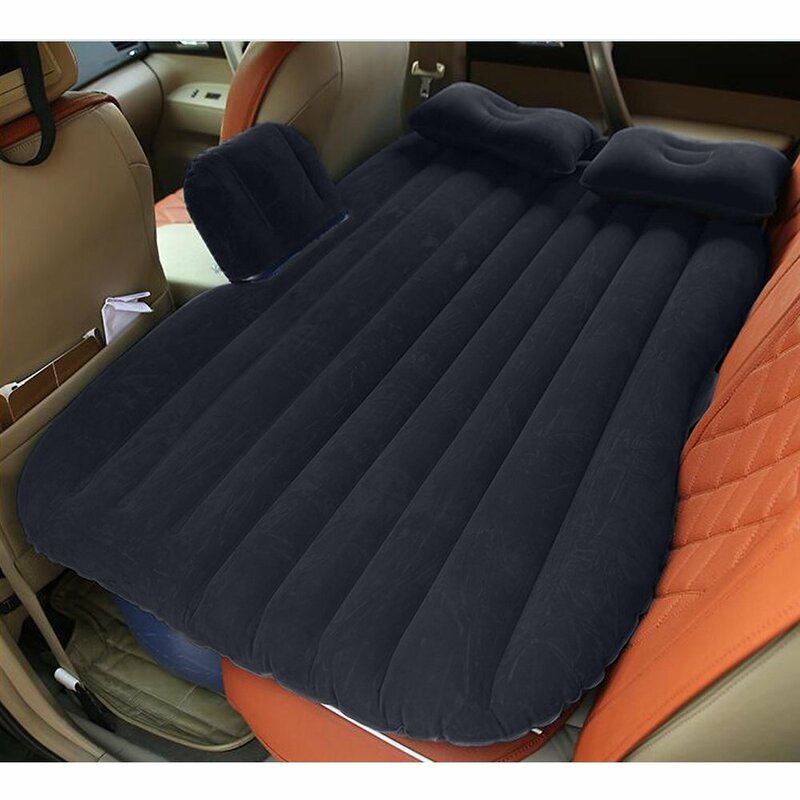 Whereas an inflatable car bed has all the advantages of air-cushioning, ensuring that you get the best rest possible while you are out on the road. The concept of sleeping on the go, got a lot of public attention with AirBedz, which to be more precise are more of a truck mattress than a backseat air mattress. The flatbed of a pickup truck make for an excellent location to place a mattress, with some larger models even being able to accommodate the equivalent of a ‘Full-size’ (one step short of Queen). Different jurisdictions of the United States have different laws about sleeping in your car. Check your local laws, or the laws of the cities you will be traveling to before setting out. State campgrounds are generally a safe bet! The United States Department of Recreation has a great resource that you can use for places to pitch your car air mattress. I’ve heard from a lot of my friends that they’ve had success in Walmart parking lots. Generally, these are relatively safe and secure, and the overnight employees do not generally tend to give a hard time to people who choose to sleep in their car. I’ve even heard somewhere that Walmart allows all sorts of camping in their parking lots, from RVs to tents, to inflatable car mattress sleepers like us. Worst case scenario is that a security guard knocks on your window, and asks you to move along. Although from all accounts I have never heard of this happening to anyone. Inflatable bed for car, whitewater raft, or both? So this is something that I thought was completely crazy when I first read it. Some of the air bed makers on our list actually claim that these inflatable devices can double as a raft or an emergency floatation device! While this makes sense in theory, I would not personally recommend it. Unless it’s a very casual situation where you know you could easily swim back to shore if necessary, please do not put take your life into your hands in this manner. If it is an absolute emergency survival situation, then of course you’ll need to use all the tools you have at your disposal… including possibly using your inflatable backseat bed as a liferaft. Just don’t try this out for fun, no matter what anyone tells you! Dress warmly, or cover your inflatable backseat bed with a heavy comforter. A good and comfy warm hat does wonders, just by itself. Did you know that we lose over half of our body heat from our heads? You’ve probably heard this statistic by now. As per this article, it’s not technically true, but regardless it’s a good portion of your heat loss. This is all counteracted with a good hat, which is one piece of clothing that will do more good than any other one item alone. Obviously you cannot fit a huge down comforter into your car, but there are many great alternatives out there which are more compact and easy to stash. The very best option out there right now is a mylar space blanket. This is literally what they use on expeditions to the Arctic and Antarctic. They are made with the same metallic material as mylar balloons, which turns out is an excellent insulator of heat. They are nearly paper thin and super warm. They do however carry two downsides. They are loud and crinkly – If you’re a restless sleeper, and toss and turn a lot (which you might anyway on an inflatable car bed), this might drive you nuts after a while. They’re not as ‘snuggly’ as a soft material blanket. To counteract this, you might consider a thin layer, such as a microfiber blanket, between you and the mylar. Safety and security are paramount when using your back seat air mattress. Remember how I had suggested Walmart as a good option earlier? Besides the whole legality issue, the biggest advantage of this nationwide store chain is that these parking lots are generally well lit and heavy trafficked. This means that there should be employees and other customers coming in and out of the lot. Hopefully this turnover and the lighting won’t disturb you too much, because these two things are actually excellent safeguards against possible criminal behavior. Consider tinting windows, if you intend to regularly use your car air mattress. This will serve a twofold purpose. Potential criminals will not be able to see you sleeping inside, and will hopefully move right along thinking it’s an empty car. In 2014 the New York Times reported a tragic accident involving a 32 year old resident named Maria Fernandes. This young woman regularly slept in the backseat of her Kia, in between three back to back full-time jobs. She had an open gas container in the back seat with her, which unfortuntely one night tipped over and spilled into the vehicle. The fumes from the spilled gas killed young Maria while she slept, without warning. This should almost go without saying. While you are driving your vehicle, all passengers should be properly seated in an upright position and buckled in. I don’t care how good of a driver you think you are (the problem is everyone else on the road). Nobody ever thinks they will be the victims of a car accident, until it happens. If you don’t have your safety belt on, your chances of survival drop off dramatically. Long-term, full-time usage of a car air mattress. Have you heard of the ‘tiny house revolution’? There are a bunch of shows currently on TV about these newest craze. The idea is to downsize your live, quit your job, sell your mortgage, and hit the road for a more fulfilling life. I’ll start by admitting, I need a full sized bed from time to time. While I love camping out on an inflatable car bed, and I’ve even done so for several weeks at a time, I have never been able to fully commit to going full time. There are some who do exactly this. Could you imagine yourself hitting the road full-time? The ultimate road warrior! One man who lived in Los Angeles spent nearly 2 years living in his pickup truck. He had installed a camper shell, which provided some degree of shelter, but the overall living space was similar to that of a car air mattress. He admitted that there were some shortcomings of this extremely mobile and simple lifestyle (long-term food storage, sanitation facilities, etc..) nevertheless he swore by it and did not intend to give it up. Update: We checked with an official representative from Walmart, and they confirmed that they do in fact allow overnight camping in their parking lots as a matter of policy. I’ve been reading about this for some time now. At first thought people seem to be joking or sarcastic, or maybe making a reference to the ubiquity of Walmart throughout the country. But there is an actual practical reason why this comes up again and again as a suggestion for where to use your inflatable mattress and sleep in her car for the night. Walmart has a strong value for RV travelers and other types of campers and road warriors, they understand that a large part of your business comes from these kind of adventuring types, your self included. Because of a policy such as this, they have managed to attract and retain a loyal army of shoppers who both love spending time inside as well as sleeping outside their national chain of stores. There is a great website called Walmart locator, just Google it, where you can find a full exhaustive directory of every single Walmart in the country. If you are not can have Internet access while you are out on the road, I highly suggest that you look up all of the locations which you will be passing through beforehand, and print them out for your reference. This is such an amazing resource, and with these locations alone you should never have trouble finding a good spot to park your car and set up your backseat car bed on location. There are a couple of fine print rules that you should know at these locations. Technically you are only allowed to stay for one night at each location. I would tread carefully and watch out in case you have an extra mean or grouchy store supervisor in a particular area, but otherwise I wouldn’t sweat it too much if you had to extend that to two or maybe even three nights. As long as you are respectful and quiet I do not think that it should be much of a problem. Still make note that this is the official ruling so if you are asked to leave please be polite and go peacefully. The next rule is that you are not allowed to set up a chair or a barbecue grill or any other camping equipment outside of your vehicle. This is mostly directed at those RV types who bring their entire homes worth of furniture and cooking gear, and may try to set up a full-fledged NFL style tailgate in the Walmart parking lot. I do not think that this applies to us humble drivers with our car mattresses, since most of us can’t fit it for grill in our SUV in the first place. Always make sure to clean up after yourself. If sending one or more nights in a public store’s parking lot, please do not throw your trash out your window, or even worse make a public restroom out of the asphalt of the parking lot. Please don’t ruin it for the rest of us outdoors folk, we already have to fight every day to maintain our reputation among the “elegant types” of this country. Other possible places to use your inflatable car mattress. This is the current list as of the time that I last research this, but policies tend to change from time to time so if you have any doubt please do your own quick research before hitting the road. Remember, when in doubt just being respectful, polite, and clean will take you a long way with the owners and employees of these establishments. Camping out in retail parking lots is a growing practice that has been affectionately named “Boondocking”. It’s actually kind of a derogatory term, which infers that the people involved in the practice are somehow backwards or uneducated. I don’t care for the term too much, but now that it has become common practice, I suppose it helps to just have a sense of humor about it. Let’s be clear, I’m just talking about a night or two in each town that you stop in, not a full scale squatting situation where you plan on living in one store parking lot for years at a time. That’s just bad form, and is abusing the benevolent policies of these fine retailers who are open-minded enough to embrace travellers like us. We’ve all seen them and stopped at them countless times. Some of you maybe have slept in them in the past. While some rest stops throughout the nation are specifically marked for RV parking and overnight camping, others are not so clear and are more of a gray area. It’s relatively safe to say that state police officers have better things to do than to bother law-abiding and peaceful citizens who are just trying to do the responsible thing by resting there had in between along the journey. In fact, this is what experts are always telling us to do as tiredness is one of the leading cause of road fatalities. If it’s a 24 hour rest stop, I really don’t see you having any problem at all putting your seats back and inflating your car mattress for a few hours of sleep. This no one coming around and looking in Windows to make sure that travelers are not sleeping back there. If you’re on sure, just be discreet about it. Put something up over the Windows which is a good practice for your own privacy and for light blocking anyway. Nobody really cares and nobody will really notice you there for one night anyway. Make sure that you feel safe at first and foremost, is that is your real concern. Take what steps you need to to protect your own life, family, and belongings and don’t worry about the risk that someone will look at you funny for doing what you love and living a free life on the road. Some State Parks require special permits for overnight camping. These permits are usually for long-term annual stays, so usually just one or two nights are something you can get away with. This varies greatly from park to park. Some of the bigger ones, such as Yellowstone are pretty strict about it however, so just proceed with caution. Usually the fees are not too unreasonable, so just book in advance and make sure that they know you are coming to visit. If you are visiting an area where 24 hour casinos are a thing, you’ll probably see that these parking lots are used day and night. Nobody will notice a car parked there quietly for a few hours in the night, since lots of people are coming in than any way to enjoy the entertainment, food, bars and other amenities. Just be responsible especially if you have problems with gambling, and do not go in and waste any of your precious money. If you know that you have poor self-control in these types of places, just don’t do it! Backseat car beds as a ‘gateway drug’ to a full time, RV lifestyle. Life on the road can be addictive, one you get a taste for it. Sure, it had its setbacks that we have to be honest about. You got a give up a little bit of space and a few of your creature comforts from your traditional fixed location living situation. But in my experience, once you get a taste for that freedom there is never any going back. I have not made the jump yet to investing in a full RV, but I will rent one about once a year and take it on a cross-country trip. In between the use rentals, I like to get out for most weekends while it is warm with one of my backseat car mattresses and to see where the road takes me. 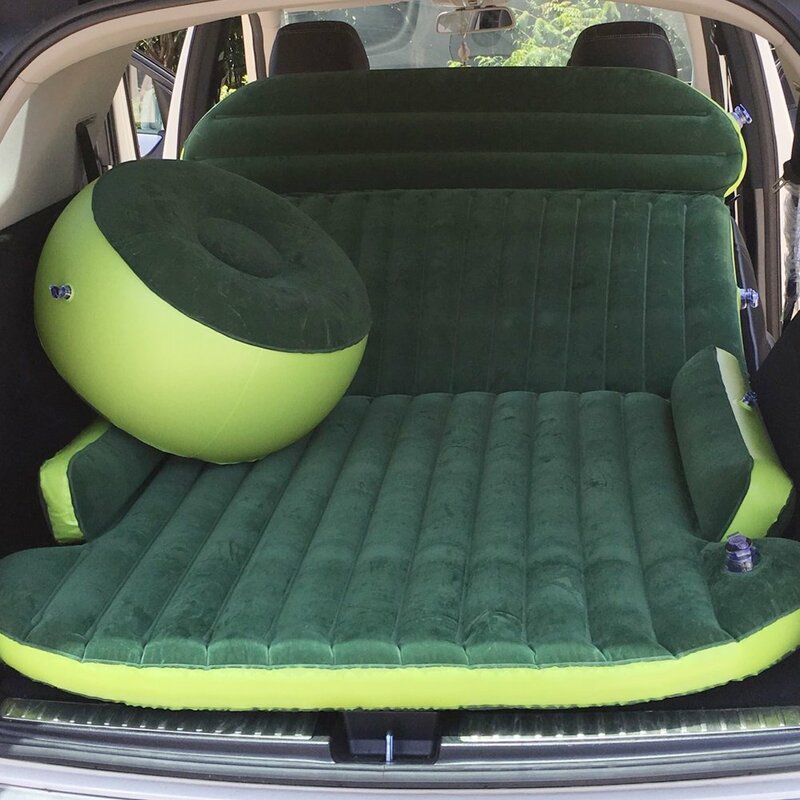 Do you have experience using an inflatable car bed? Please contact us with your recommendations, and we’ll add them to this list!